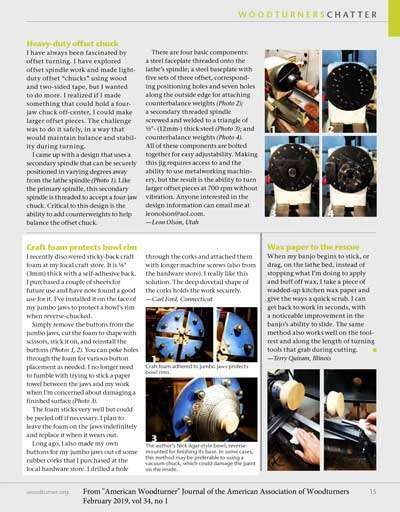 Here is my “Craft Foam Projects Bowl Rim” tip that appeared in the “Tips” section on page 15 of the AAW February 2019 “American Woodturner” Journal. Note: Click here to view PDF with Photos 1, 2, 3 referenced below. I recently discovered sticky-back craft foam at my local craft store. It is 1/8″ (3mm) thick with a self-adhesive back. I purchased a couple of sheets for future use and have now found a good use for it. 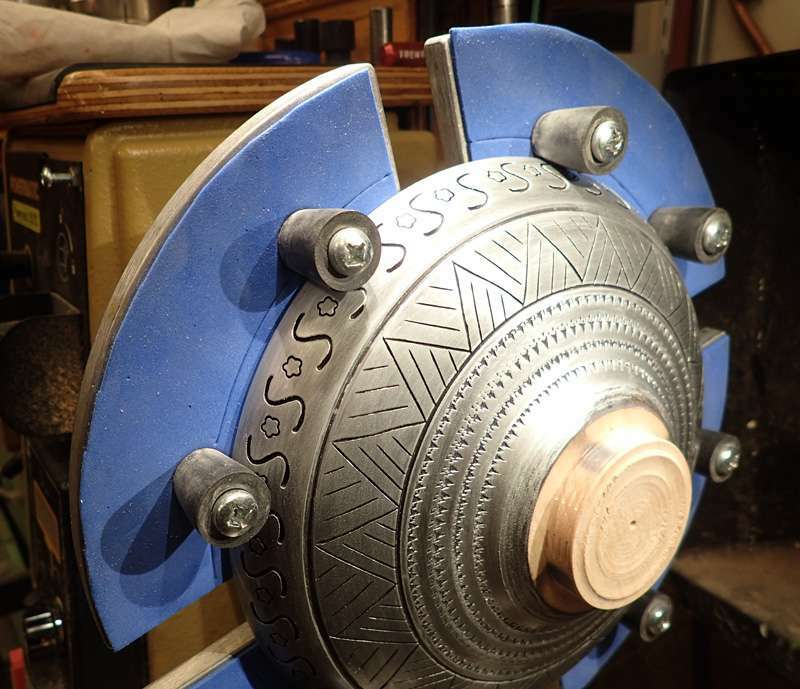 I’ve installed it on the face of my jumbo jaws to protect a bowl’s rim when reverse-chucked. Simply remove the buttons from the jumbo jaws, cut the foam to shape with scissors, stick it on, and reinstall the buttons (Photos 1, 2). You can poke holes through the foam for various button placement as needed. I no longer need to fumble with trying to stick a paper towel between the jaws and my work when I’m concerned about damaging a finished surface (Photo 3). The foam sticks very well but could be peeled off if necessary. I plan to leave the foam on the jaws indefinitely and replace it when it wears out. Long ago, I also made my own buttons for my jumbo jaws out of some rubber corks that I purchased at the local hardware store. I drilled a hole through the corks and attached them with longer machine screws (also from the hardware store). I really like this solution. The deep dovetail shape of the corks holds the work securely. You can purchase the rubber corks with a hole already thru them from www.mcmaster.com item # 9545K116 $8.33 per pack of 25 on 4/4/2019. The matching 30mm long 8mm screws are #92000A438 $8.15 per pack of 25 on 4/4/2019.